Woah two posts in one day?? I know right. One of my goals in regards to the blog is to try and link up more often with other people around the “blogging world”. I really want to become a little more involved and see what kind of cool experiences are out there. 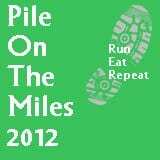 This month I decided to participate in Monica‘s Pile on the Miles Challenge! What: Online challenge to walk or run more during turkey month. When: November 1 – December 1. Winners announced Dec 2nd. Why: To challenge yourself and encourage others to move more. This isn’t about weight loss or distance – it’s about doing a little extra this month. 1. Sign up on the Google Spreadsheet by October 31st. There will be a place for your name, blog address and twitter handle. You must put in a name, but the other entries are optional. If you have a blog please add it so we can create the most epic blogroll ever! 2. Set a goal at the beginning of the challenge to WALK or RUN x amount of miles. These could be miles on the treadmill OR outside/inside walking OR running. No biking or elliptical miles don’t count. 3. We will be using calendar weeks Sun-Sat, but the first week is Thur-Sat. It’s clearly marked on the spreadsheet. Please update your miles for the previous week by Monday. 4. Optional: Leave a comment on RER Nov 1 and 5, 12, 19, 26 with your Mileage Goal for that week. All comments on those posts will be entered into a giveaway. I signed up!! I have my goal as 140 miles in November (I am pretty sure you’re supposed to put your TOTAL mileage goal in to sign up and then you update your weekly mileage every Monday? I wasn’t 100% sure, but that seemed right). In addition to my normal running (which will easily put me over 100 miles for the month) I want to start adding walking miles too! My goal is to add 3 miles of walking every day I don’t run.